Since the 1970s, members of the LGBTQ community and its allies have designated June as a time to celebrate diversity and raise awareness of the important issues still facing this community today. In honor of this month-long celebration, here are four ways to build an inclusive culture in your neighborhood. Would you describe someone as “a person who uses a wheelchair” or “a wheelchair-bound person?” Small shifts can make a big difference. This guide from Emerson College is a great reference to learn appropriate terms to use in small talk at the mailbox. If you feel it’s appropriate, you may want to ask neighbors their preferred gender pronouns. The University of Milwaukee suggests: “Try asking: ‘What pronouns do you use?’ or ‘Can you remind me what pronouns you use?’ It can feel awkward at first, but it is not half as awkward as making a hurtful assumption.” Of course you won’t always get it right, no one’s perfect! Making an effort is a sign you recognize and respect everyone has a unique identity. If you are interested in getting to know your neighbors on a personal level, see if there is a meetup group geared towards connecting LGBTQ in your community, or start one of your own. 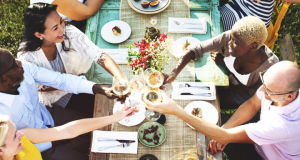 If you have the opportunity to be a dinner host, invite a family or people in the neighborhood to share a meal with you and exchange views on life. After all, nothing bring people together like good food! It’s a great community event and fantastic way to connect with neighbors. Round everyone up and scout out a spot along with parade route. Most festivals have family-friendly events – check the local schedule to see what’s offered in your area. RE/MAX agents serve as leaders and members of a variety of organizations that celebrate diversity, including the National Association of Gay and Lesbian Real Estate Professionals. To find the right home for you in the Chicagoland area, visit Christopher’s website at: http://HomesInTheFoxValley.com.